2010 was the year when U.S. Mint released the first set of five America The Beautiful Silver Coins. This program was started after the America’s Beautiful National Parks Quarter Dollar Coin Act of 2008 was enacted by the US Congress. To honor the splendor and beauty of the American National Parks, a total of 56 coins will be released from 2010-2021. 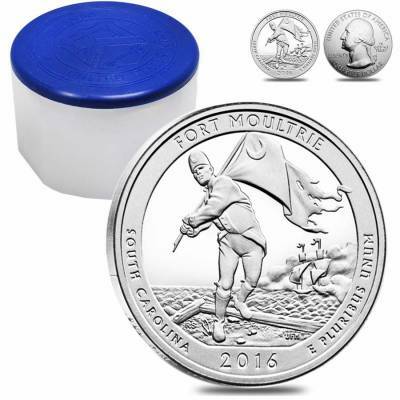 Each year a set of five coins with different reverse designs will be released while the obverse will be the same. In 2021 however, only one coin will be released. Fort Moultrie at Fort Sumter National Monument Coin will be the fifth and the last strike of 2016 by the US Mint. It is the 35th coin in the entire series of the very popular America The Beautiful Silver Coin Program. 35th coin in the series Honoring South Carolina. Individual coins will be shipped in plastic flips, multiples of 10 in mint-issued tubes, and multiples of 100 in mint-issued monster boxes. 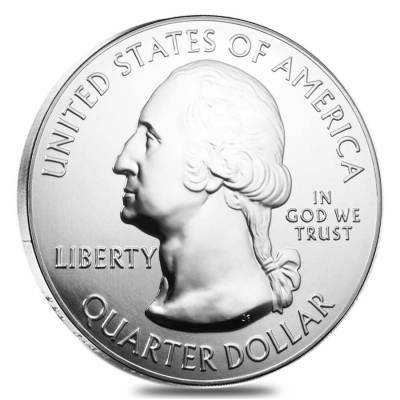 Obverse: Depicts the restored version of John Flanagan design, a portrait of George Washington. Reverse: Sergeant William Jasper returning the regimental flag to the ramparts while under attack from a British ship, a design by Richard Scott. 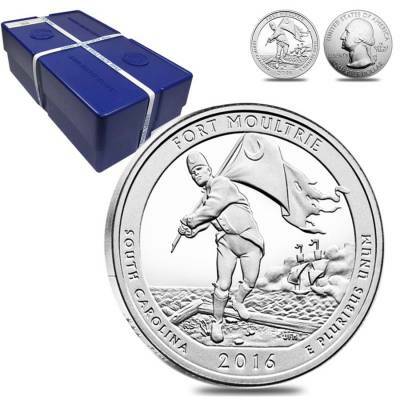 100% authentic and guaranteed by the U.S. Mint. While the first fort was still being built, the British Commodore Sir Peter Parker attacked it on June 28, 1776 with nine warships. After a nine-hour battle, with heavily damaged ships, the British were forced to retreat. After this victory under the commander in the battle, George William Moultrie, the fort was name Fort Moultrie. William Jasper a sergeant in second South Carolina Regiment had an important role to play in defending the Fort Moultrie. When a shell from a British war ship shot away the flagstaff containing the flag designed by William Moultrie, Jasper recovered the flag and held it up till a new permanent flag post was produced, this inspired the troops who held out until sunset and won the battle. Fort Moultrie boasts of a 171-year history of American seacoast defense. After being neglected and rebuilt several times, in 1809 a third Fort Moultrie was built in Sullivan’s Island and was established as national site in 1948. In 1960 Fort Moultrie was transferred to National Park Services by the Department of Defense. The reverse exhibits a design by Richard Scott and sculpted by Joseph Menna shows Sergeant William Jasper returning the regimental flag to the ramparts while under attack from a British ship. This design was selected from among seven other candidates. 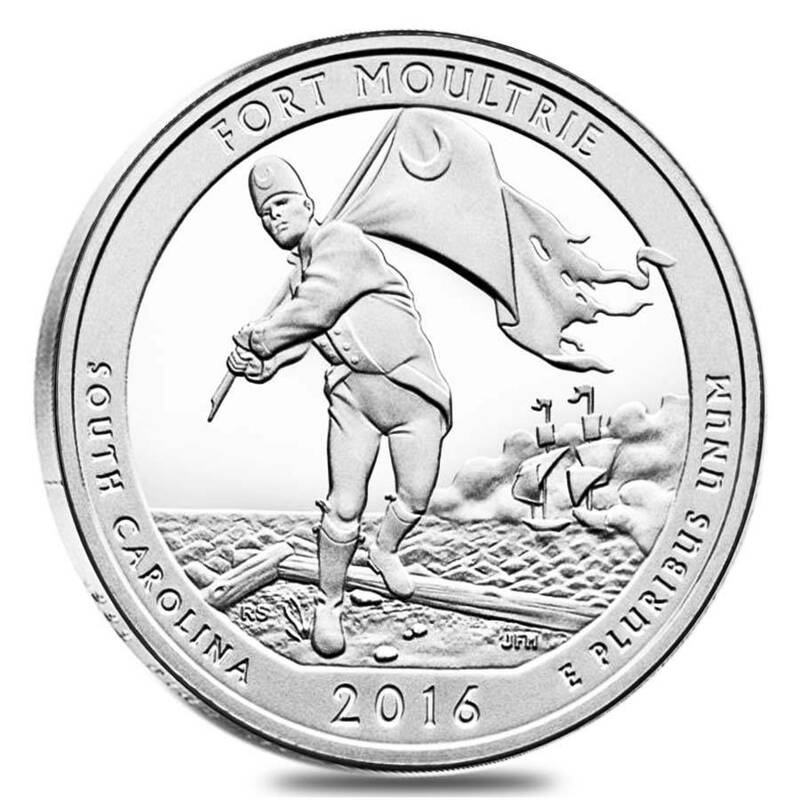 Inscriptions are “FORT MOULTRIE,” “SOUTH CAROLINA,” “E Pluribus Unum,” with the year of Mintage (2016). You would also like to check out our other popular and beautiful collections of American Silver coins.